We offer quality repair and competitive prices for all of your exhaust system and muffler repair needs. Make sure to stop by our 405 W. Main Street location for an inspection, as a damaged exhaust can hurt both your car and the environment. 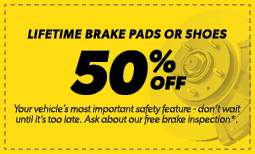 When you need brake repair, brake pad replacement, or even a total brake job, our local Jamestown, NC Meineke is there to help you with everything you need to drive (and stop) safely. All of the men at the Battleground Ave. location (Greensboro, NC) were wonderful! They were helpful, kind, knowledgeable, and although very fast, they were focus on the task and doing it right. Bill Bridges does great work. Joe and his staff are the best!